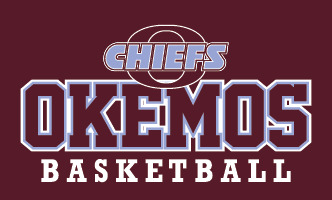 OKEMOS HS GIRLS BASKETBALL Apparel and Accessories are now available to order online! VERY IMPORTANT - BEFORE YOU ORDER PLEASE CLICK ON THE BRIGHT YELLOW BOX "CLICK HERE FIRST - FILL IN INFO" TO FILL IN THE INFORMATION NEEDED TO DELIVER YOUR ORDER TO THE CORRECT TEAM. ORDER DEADLINE IS TUESDAY, DECEMBER 4th. NO ORDERS WILL BE TAKEN AFTER THE DECEMBER 4th ORDER DEADLINE. You may CUSTOMIZE any of the shirts with PLAYER NAME and PLAYER NUMBER at an additional charge. To customize, make selection on the page of the item you are ordering. Please select your size carefully. All orders are custom made to order and may not be returned for size exchange or refund. For additional help with sizing, there is a size chart located on the description page of each individual item.